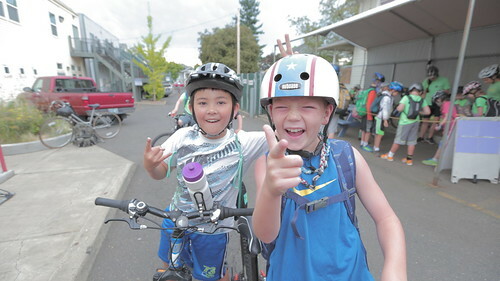 May 28, 2015 – Portland, Ore. – What better way for kids to spend their summers than with new friends at the Community Cycling Center’s Bike Camps.This summer, the Center will offer more camps in two locations: NE Alberta Street at the Community Cycling Center headquarters, and at SE 13th Avenue at Sellwood Cycle Repair. As summer approaches, kids will flock to the bike shop with their bikes, imaginations, and goals to expand their geographic and personal horizons. Bike Camp teaches safety, group riding technique, right of way, and basic, hands-on maintenance skills. Yet the biggest lesson is the empowerment kids receive from a summer adventure on two wheels. This summer the Community Cycling Center brings expanded camp offerings. There’s hardly anything cuter than a first grader on a bike. For our youngest riders, every time on the bike is an adventure. The Community Cycling Center wants to give first graders the space to work on bike skills in an environment that can accommodate the silly playfulness that is special to this age. This year, the Center will offer Pedalers Camp, a safe setting for early riders to develop their basic riding skills. 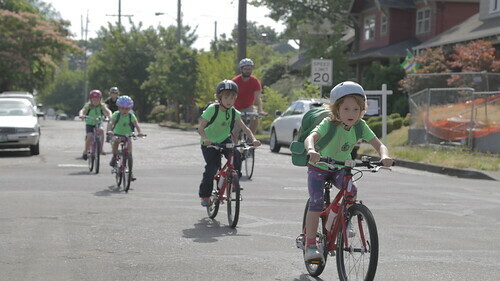 Last year the Community Cycling Center launched offsite camps at a new hub, Sellwood Cycle Repair, making Bike Camp more accessible for families living in SE and SW Portland. 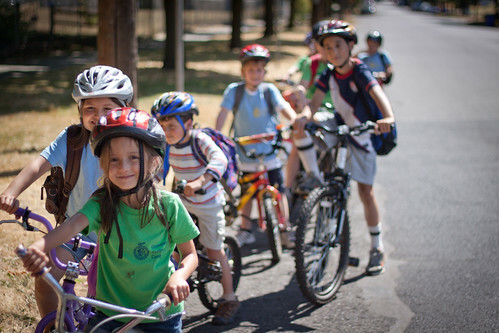 Due to the popularity of these camps, this year they are expanding their offerings out of Sellwood Cycle Repair from 7 camp sessions to 12 sessions. Themed Camps are back! Last year the Community Cycling Center piloted two new camps: Crafty Cruisers and Spanish Immersion. The Crafty Cruisers explored the possibilities of incorporating bike parts into creative art projects, like bike tear-downs, creating cog-stencils, and customized tool creation. The Spanish Immersion Camps were a fun setting for campers to develop their cycling and language skills simultaneously.Middle Schoolers can still explore Portland’s food culture with Foodcart Freewheelers. They can also try their hands out wrenching on bikes and meeting local bike builders in our Mechanics Camp. Each week-long Bike Camp session costs $290 (prices vary for specialty camps and short weeks). The camp hours are 9am until 3pm.